Why do they call you Long John Silver? It’s because of my pirate ancestry, innit? So, it’s not the underpants then? Everybody wears long johns in the winter, it’s cold! That’s not what you told Andrew. I may have embellished things a little bit. Ah well, it will soon be spring. I can’t do much today, I can’t get lovely photographs it is too dark. So let’s look at some insects instead. Dragons and Damsels Okay? 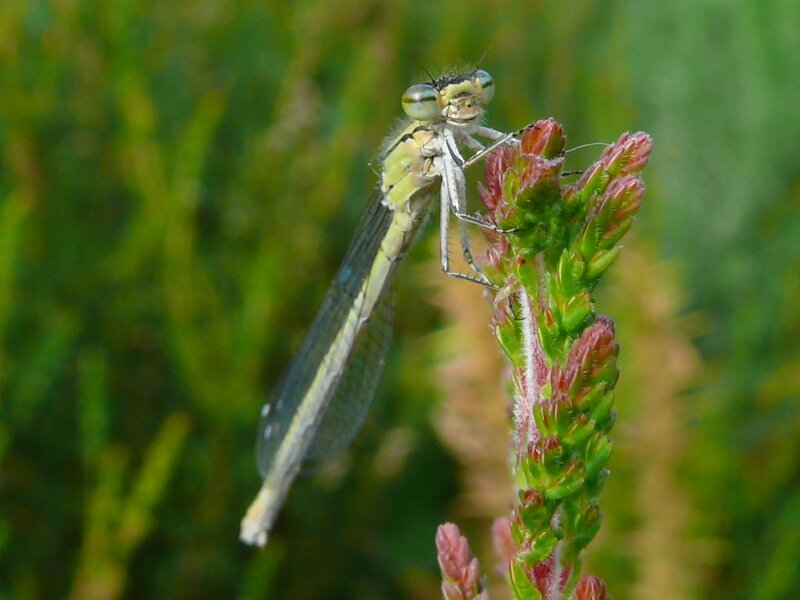 This is the female of one species, Common Blue Damselfly, lovely? This is the male. He is a bit shy. I am sure that if you just go over and say hello then she will be pleased to say hello back. I forgot, the odonata are a bit carnivorous. I think she liked you. It is great that they are carnivorous 😀 The things they eat need eating. Come into my world little Dragonflies. This one is a Southern Hawker. 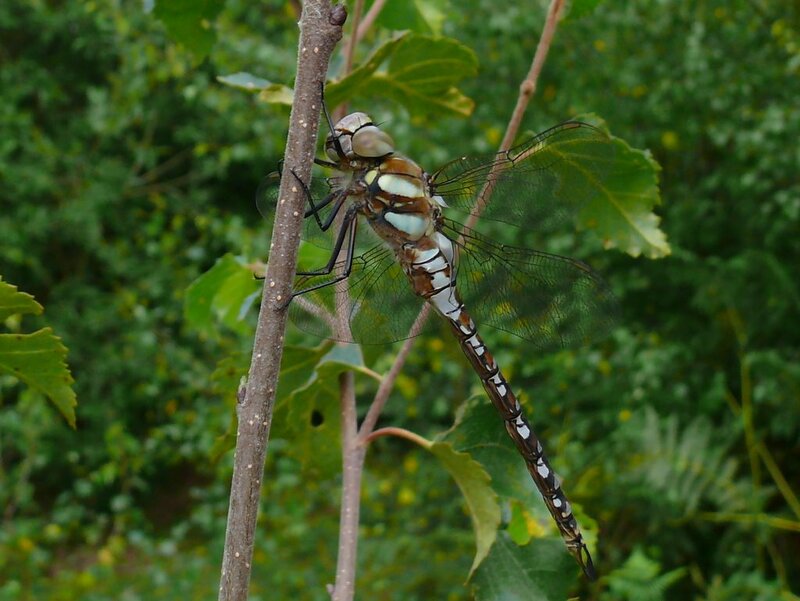 This next one is a Migrant Hawker. 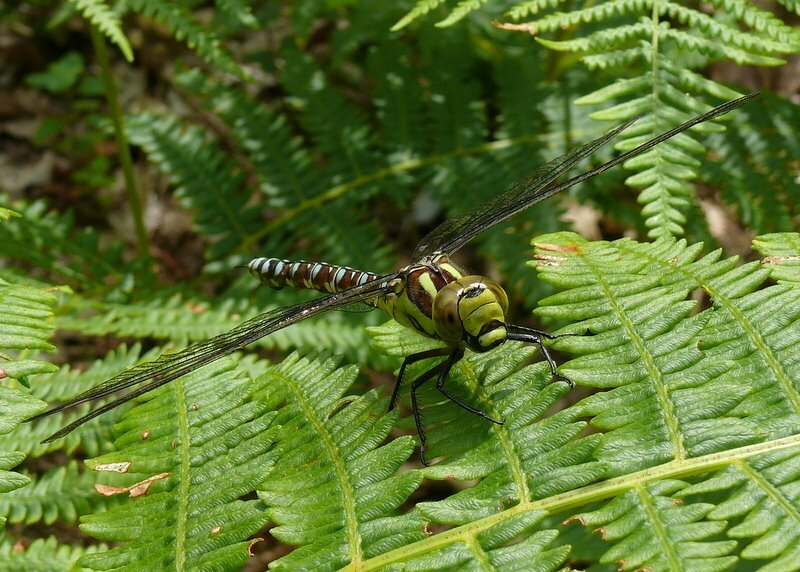 This is a Hairy Dragonfly, sometimes known as a Spring Hawker it is the earliest of the big blue dragonflies to appear but it is not that early, it arrives in May. 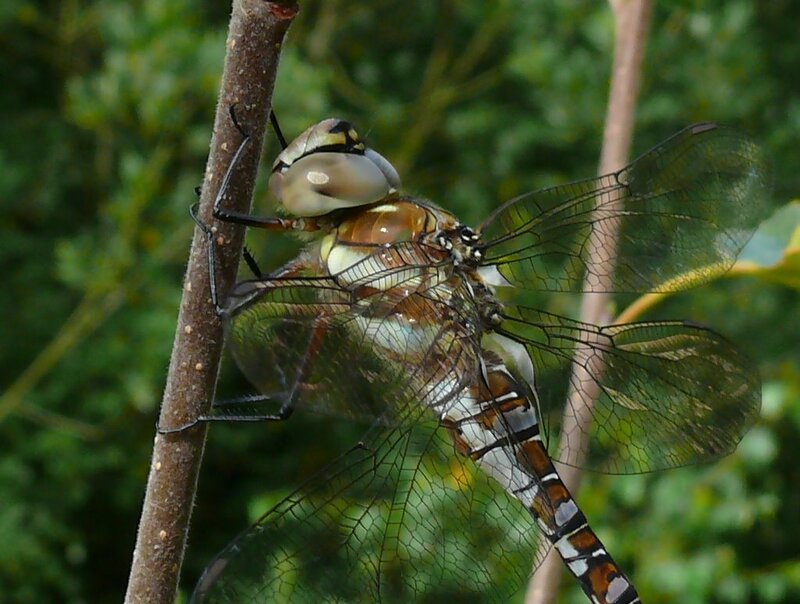 The Hawkers above all belong to the same family (Aeshnidae) They are the largest and fastest of our Dragonflies. 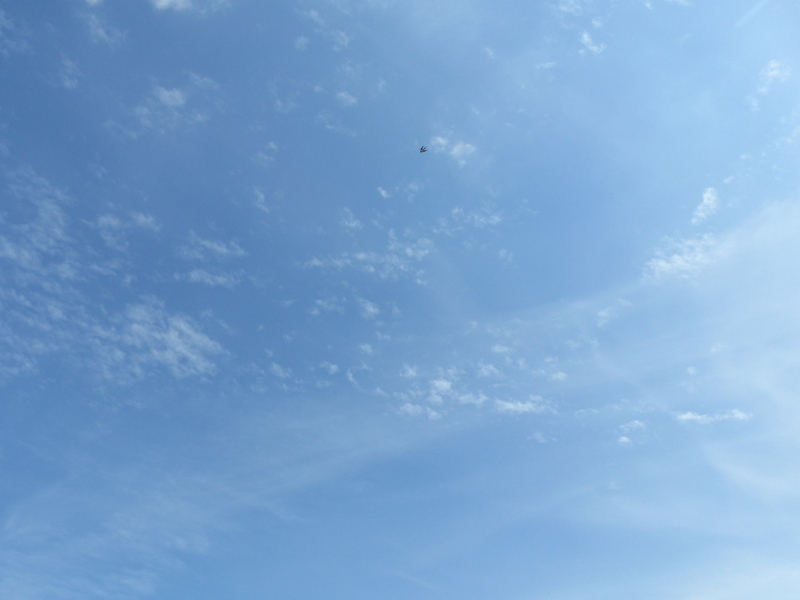 They hunt by patrolling the skies and swooping down on their prey like Hawks. 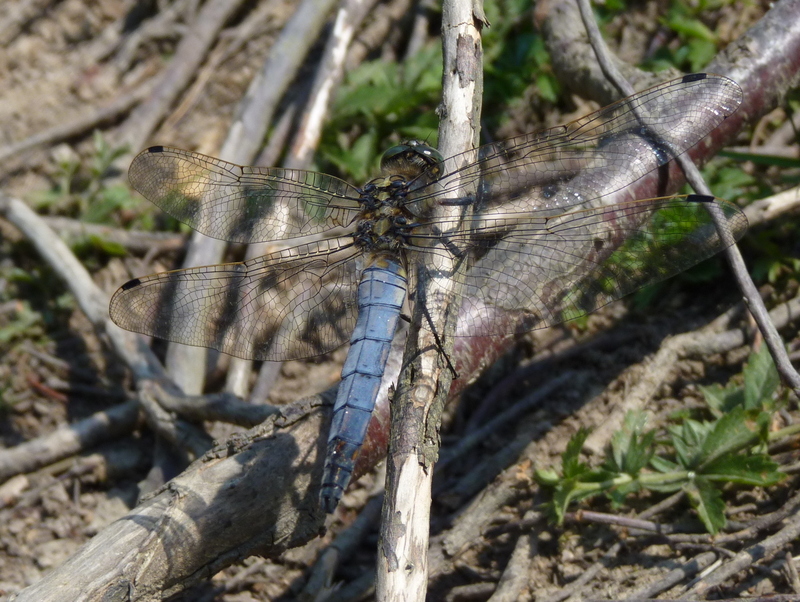 We also get a lot of Darters, Skimmers and Chasers, these belong to the family Libellulidae, the largest family of Dragonflies. 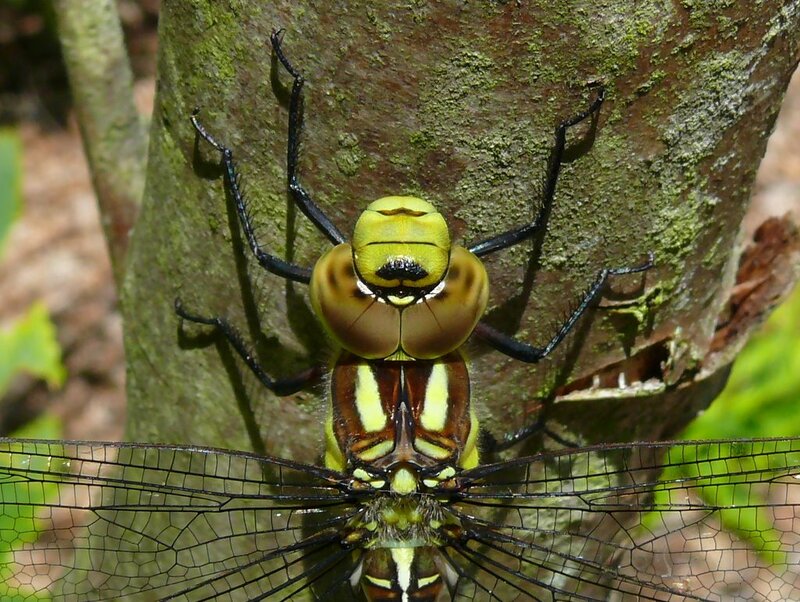 These Dragonflies tend to be ambush predators rather than Hawks. 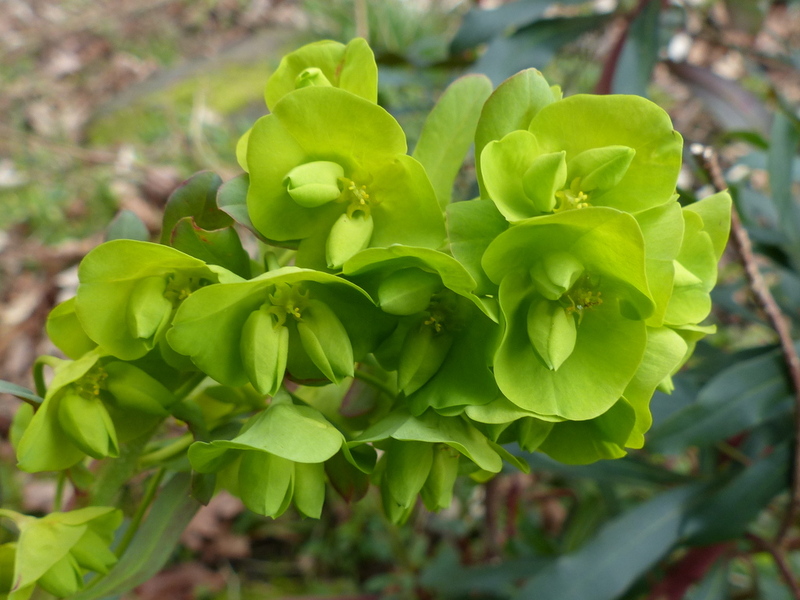 I was talking to a friend in Vancouver recently about lime green flowers and I got inspired to add Wood Spurge to EW. Thank you David. 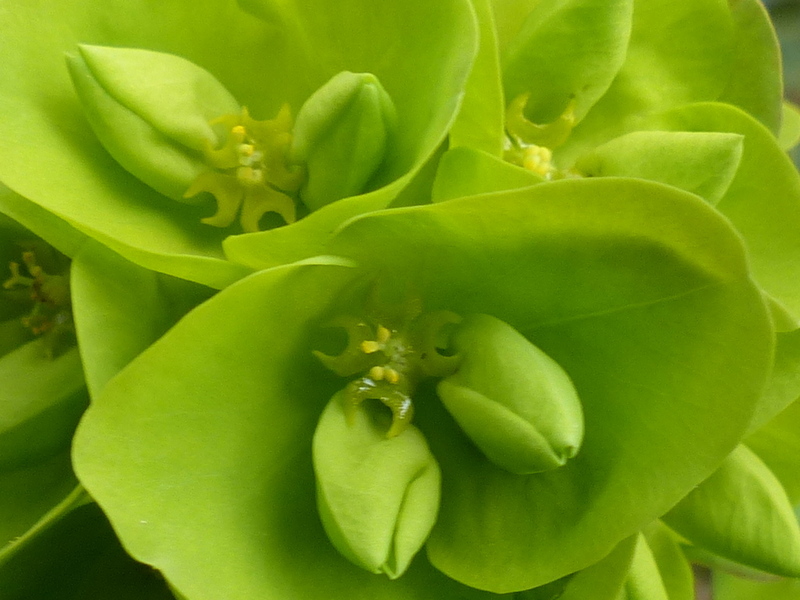 Euphorbia is a genus of plants commonly known as Spurge. 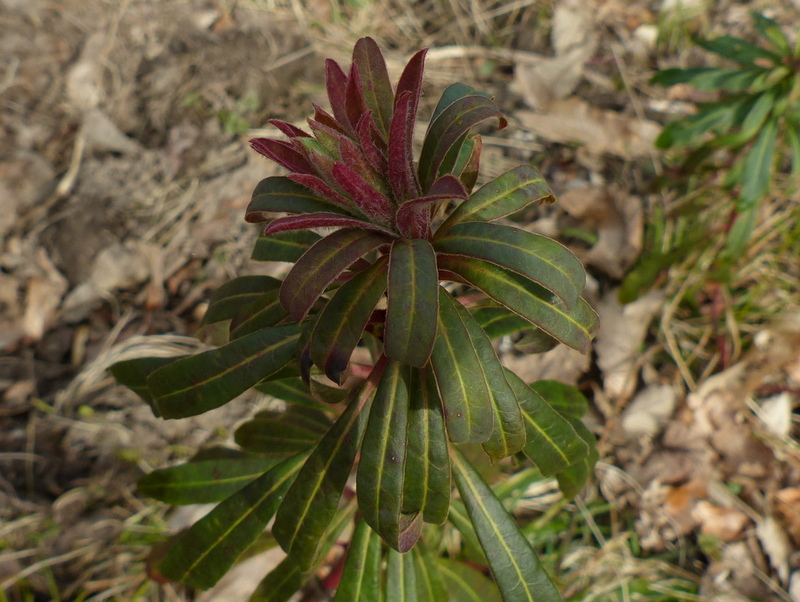 There are about 2000 species in this genus including the familiar Christmas Poinsettias and the Rubber Tree. 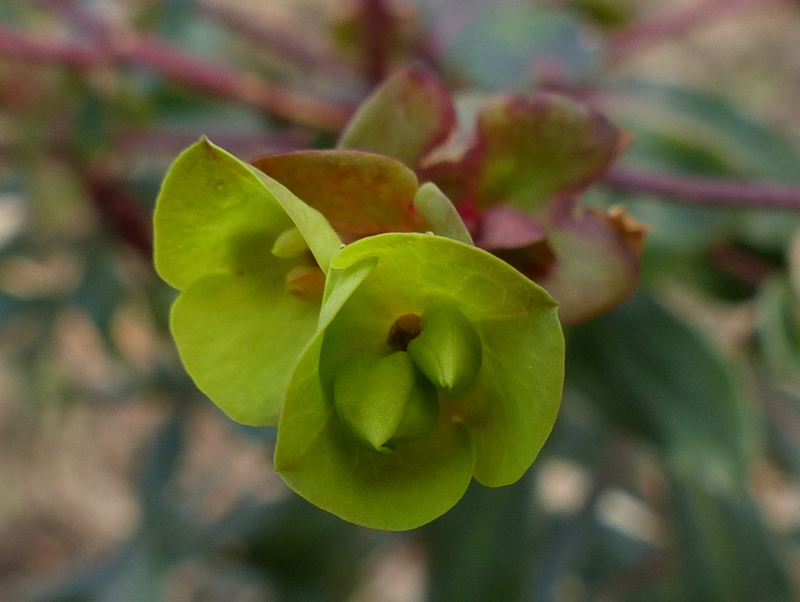 In South Africa some Euphorbia have developed characteristics very similar to Cacti and are often incorrectly referred to as such. 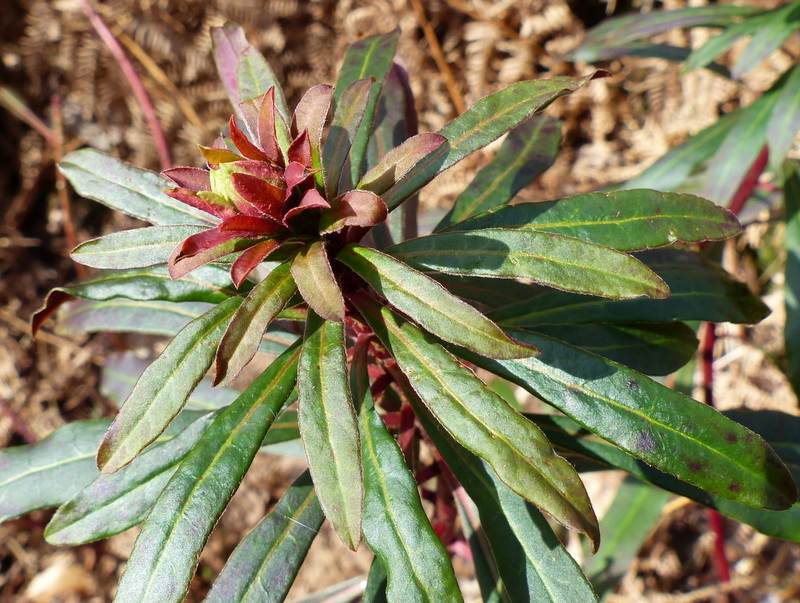 All Euphorbia species contain a milky white, toxic sap in the stem and leaves which can severely irritate the skin on contact. 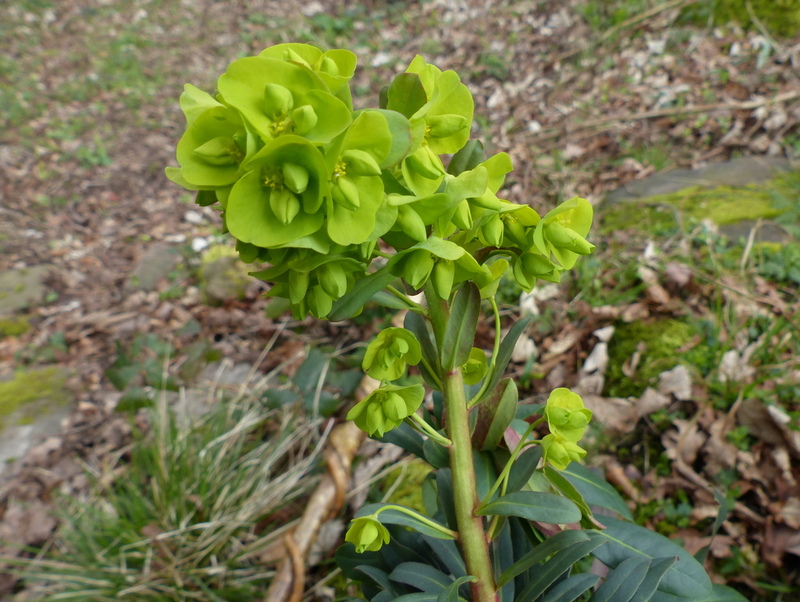 The Wood Spurge is a species native to Europe and to Southern England. 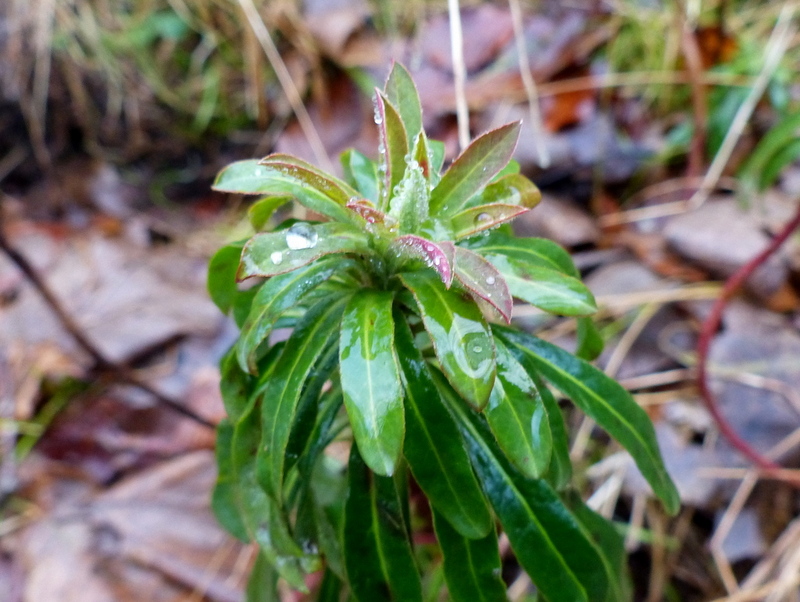 It grows in woodland and shaded hedgerow. 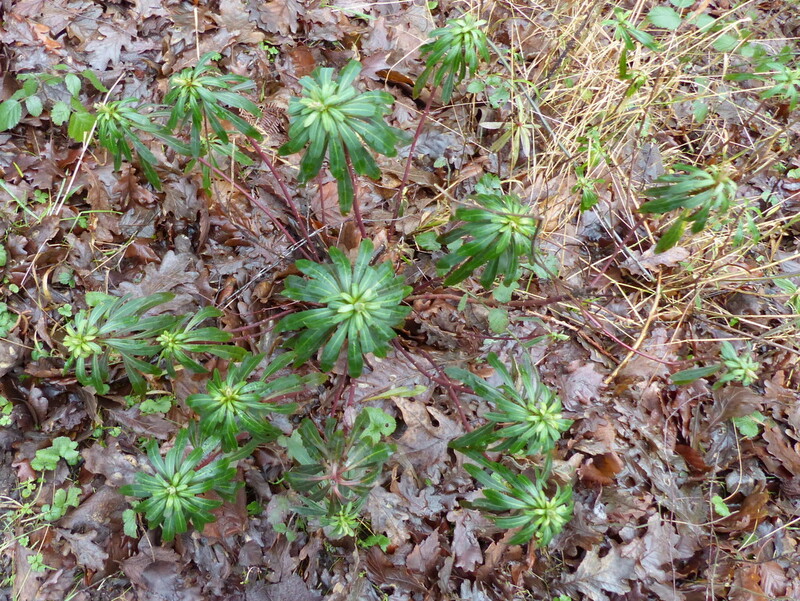 It is an evergreen perennial and the small plants are a common sight in winter. 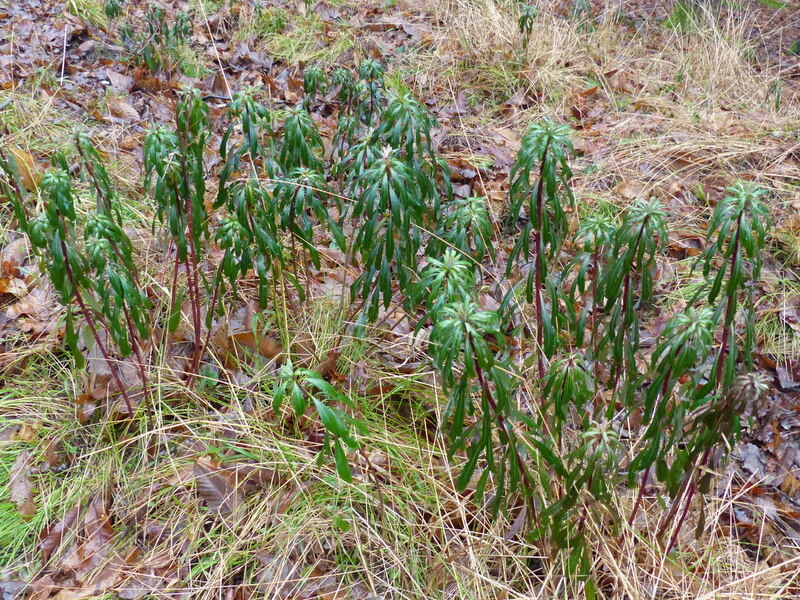 Wood Spurge spreads by underground rhizomes so you will often find plants growing close together in a group. 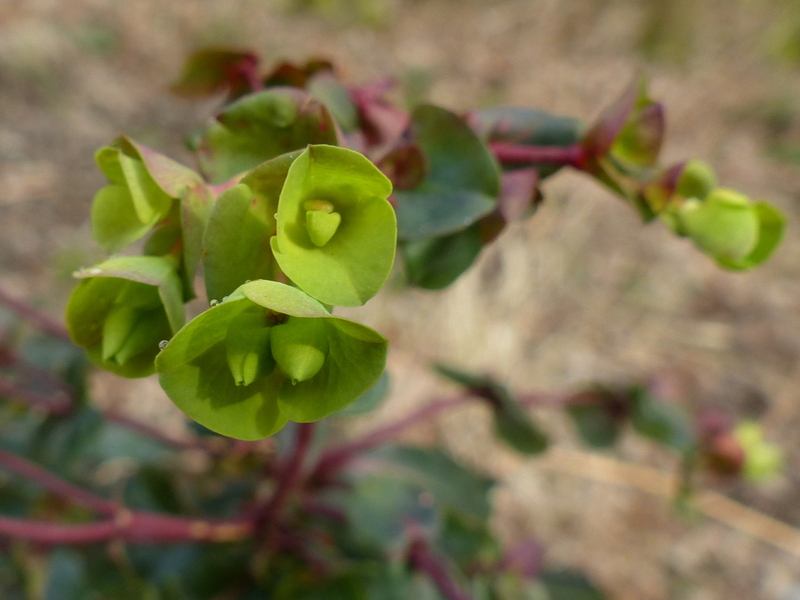 The Wood Spurge has a complex and very unusual flower. 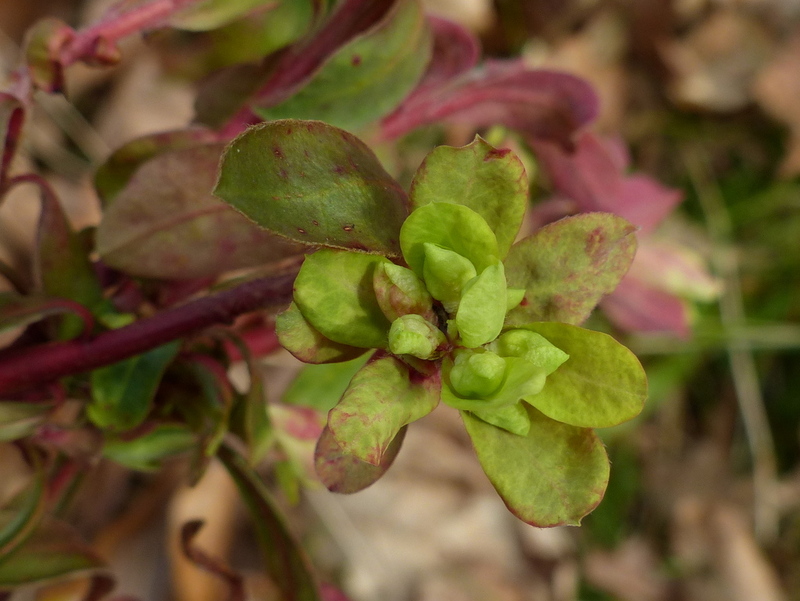 The green buds that you see in these pictures are not really flower buds, they are a pair of modified leaves that contain an unusual flower head. 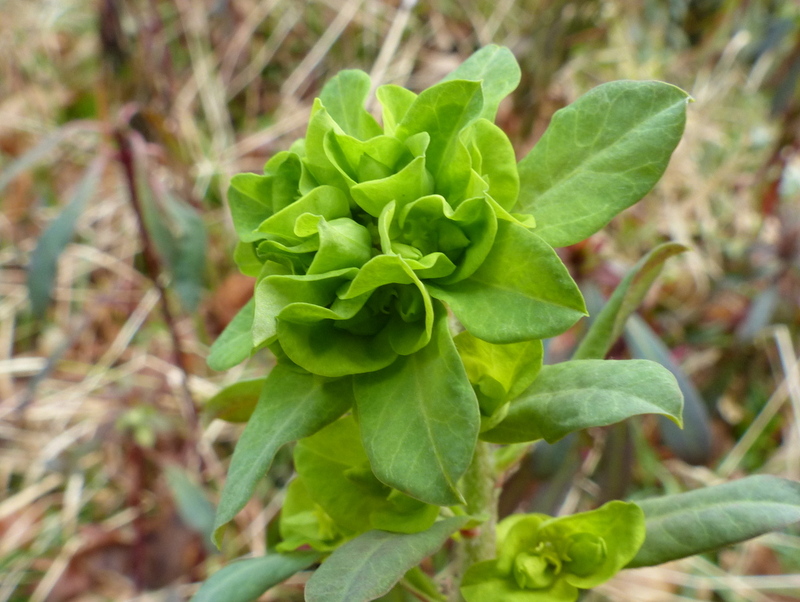 The “Bud” is called a cyathium (plural, cyathia) sometimes referred to as a “false flower” and it contains the inflorescence of the Spurge. There is quite a lot going on inside each cyathium. 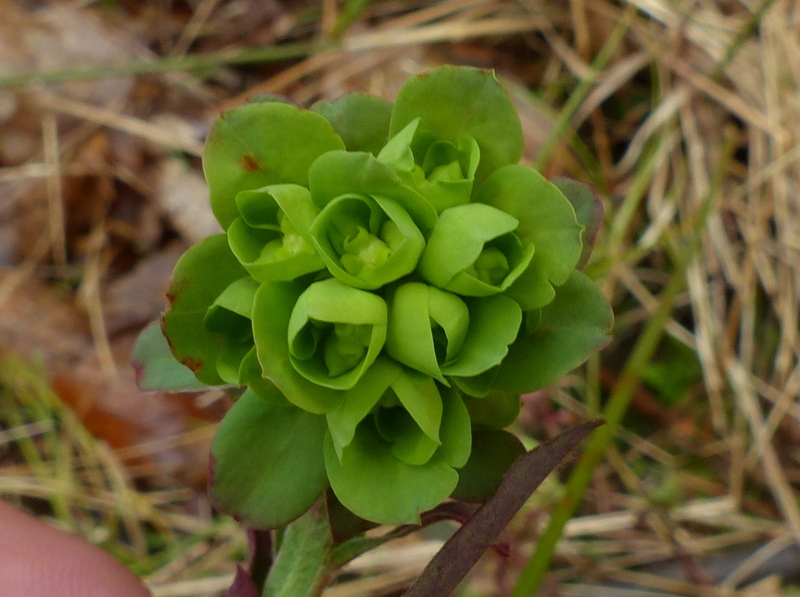 There are four small “horse shoe” shaped glands, called “Involucral glands”, these glands are not part of the flowers themselves but part of the cyathium, they produce nectar. 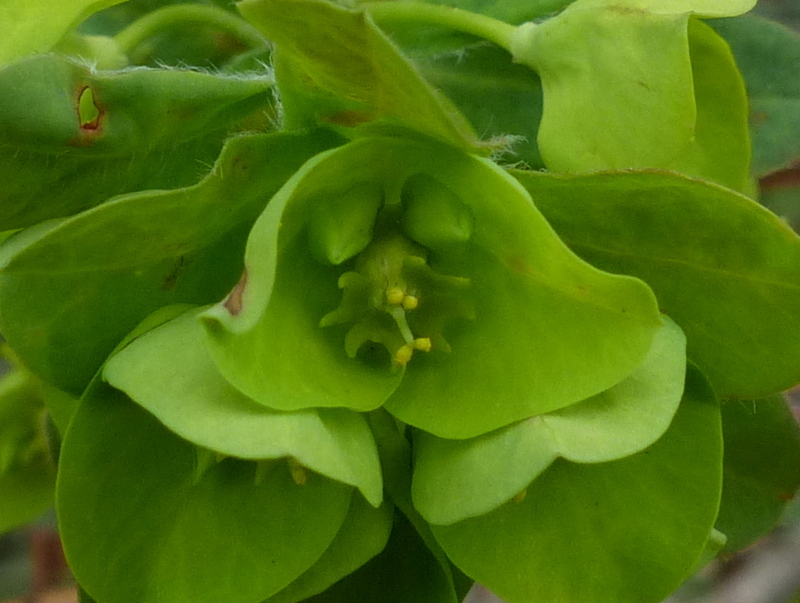 The flowers themselves are the small two lobed yellow anthers in the centre of the horse shoes. There is nothing more to the flowers than a single stamen with two yellow anthers at the top. The anthers produce pollen. 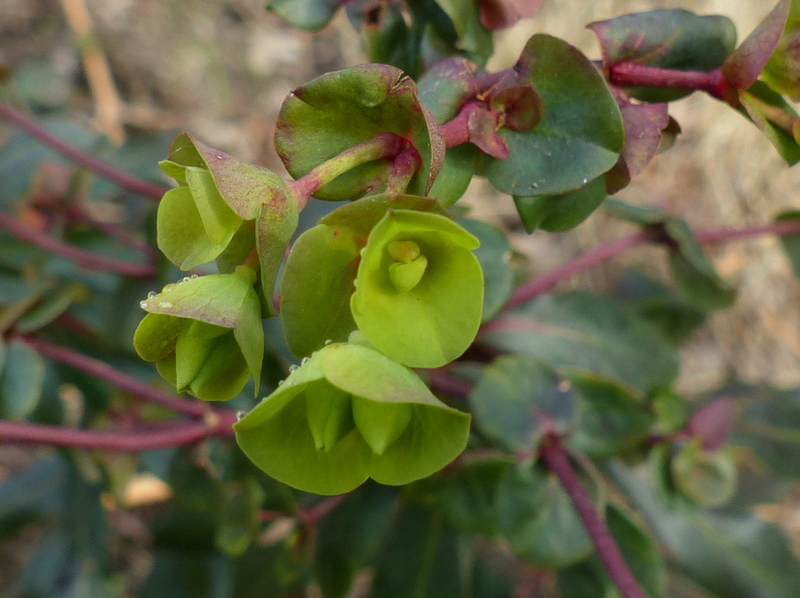 The two large bud like objects beside the flowers are in fact further cyathia. So there are flower heads growing out of each flower head as well as flowers and nectar producing glands. 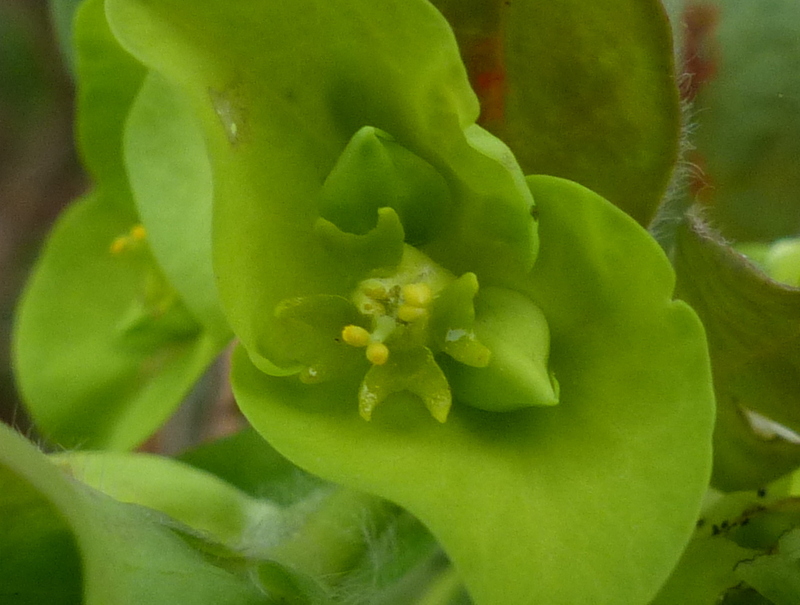 The cyathium also produces a female flower. 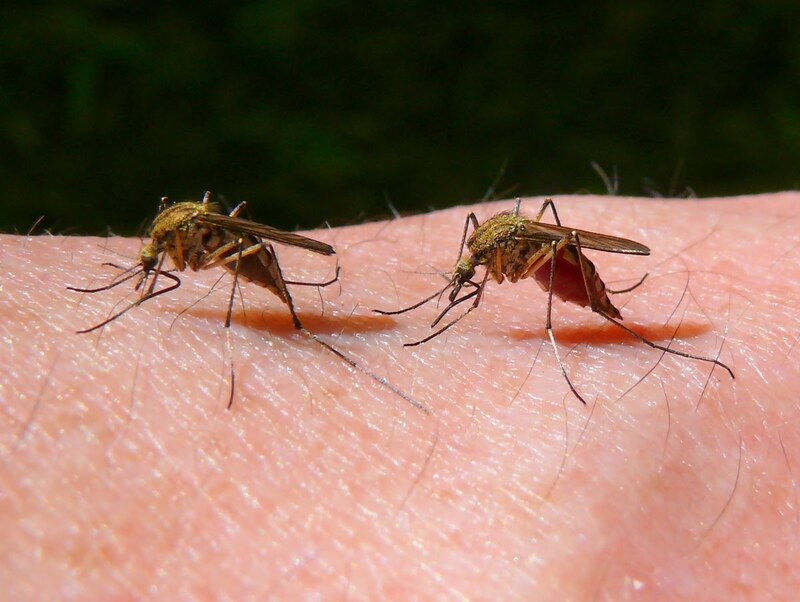 It consists of nothing more than a three lobed stigma (pollen receiving organ) leading down to an ovary. The female flower is produced before the male flowers that I have shown you and drops down out of the way when the male flowers arrive to avoid self pollination. I don’t have photographs of the stigma at this time. It sounds complex but it is not that difficult to understand. The horse shoes are producing nectar, the flowers are just the stamens in the middle and the buds are new flower heads with all the same stuff inside them. 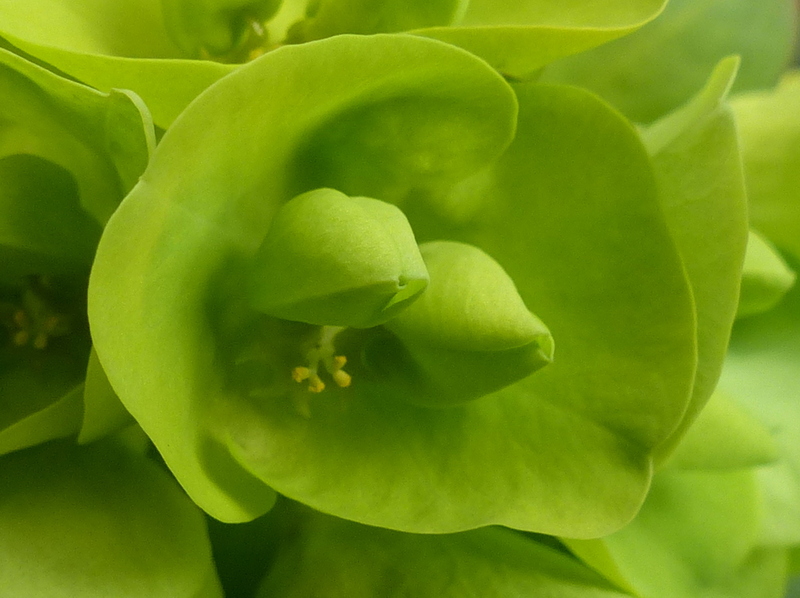 It is a lime green flower and it is beautiful. Previous PostIt’s Botany! 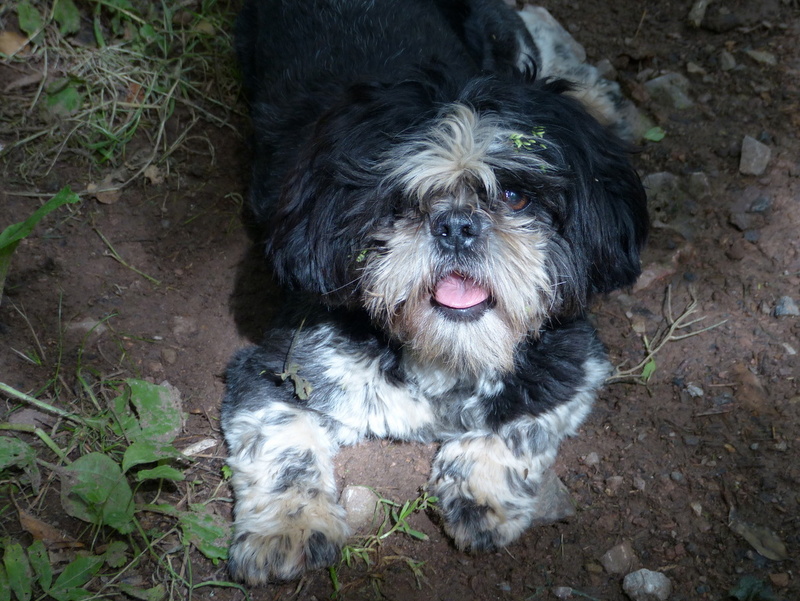 It’s not Walkthebloomin’Dogany!Next PostHazel & Co. Thank you Keira 🙂 Fizz is thrilled to be described as a “Wee Houndling.” Is there a touch of the Gaelic in that Australian accent? Oh definitely – 😀 Wishful at least, but the heritage is there. You’re right about the weather! 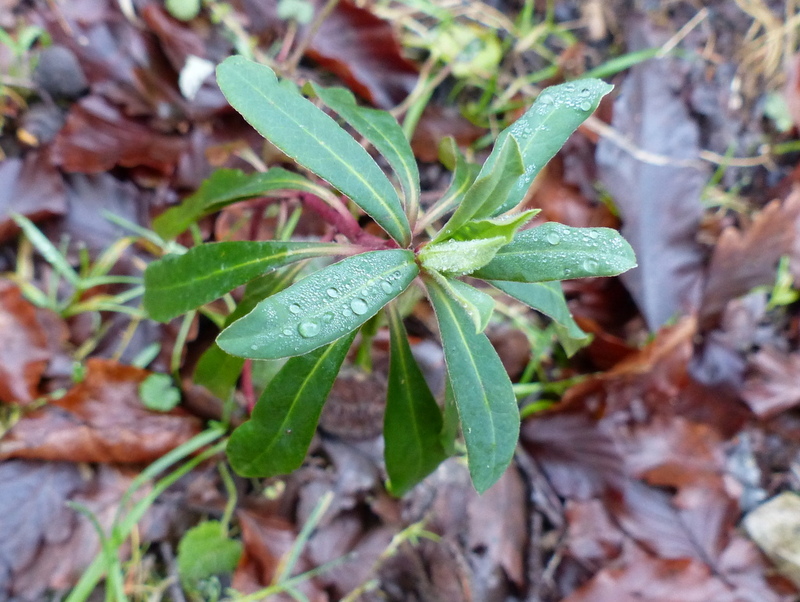 How comforting to know you have the rain, sleet and snow too! 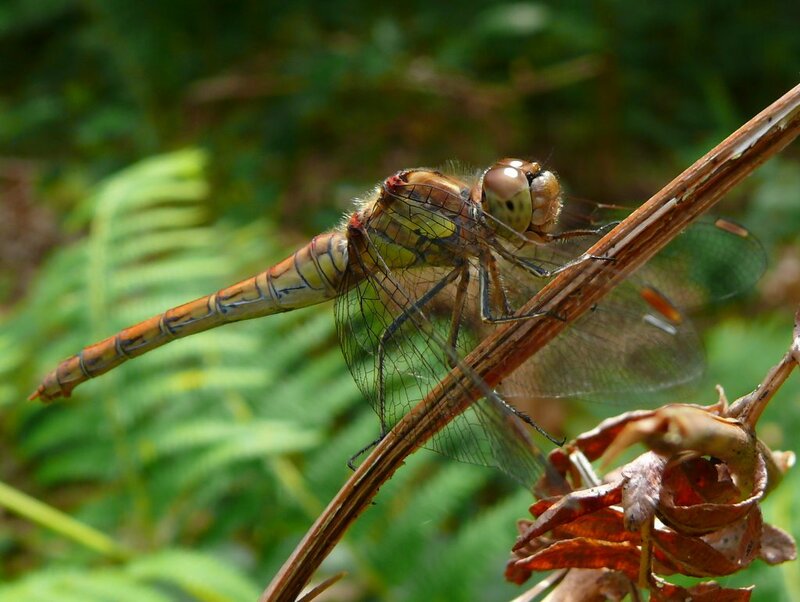 Dragonflies are my absolute favourite and I have been trying to learn more about them. 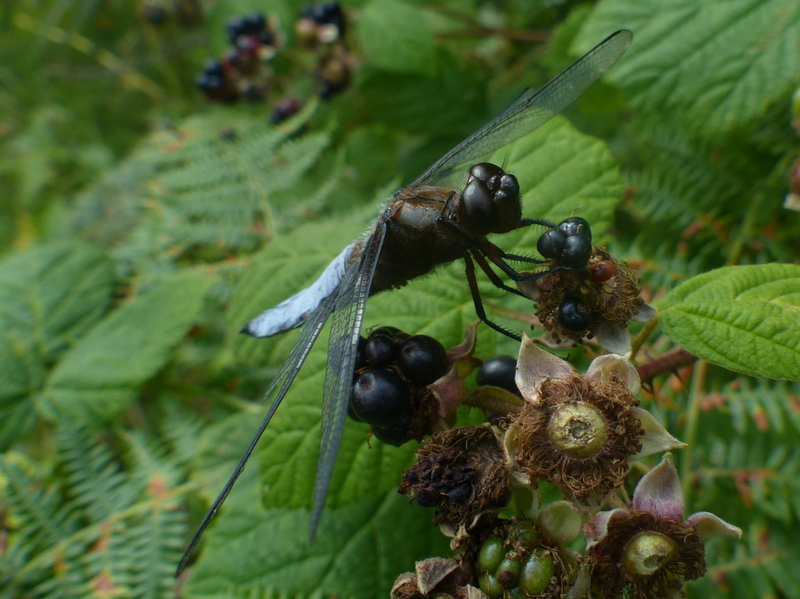 I will be making a page for my blog about the dragonflies I see in my garden. 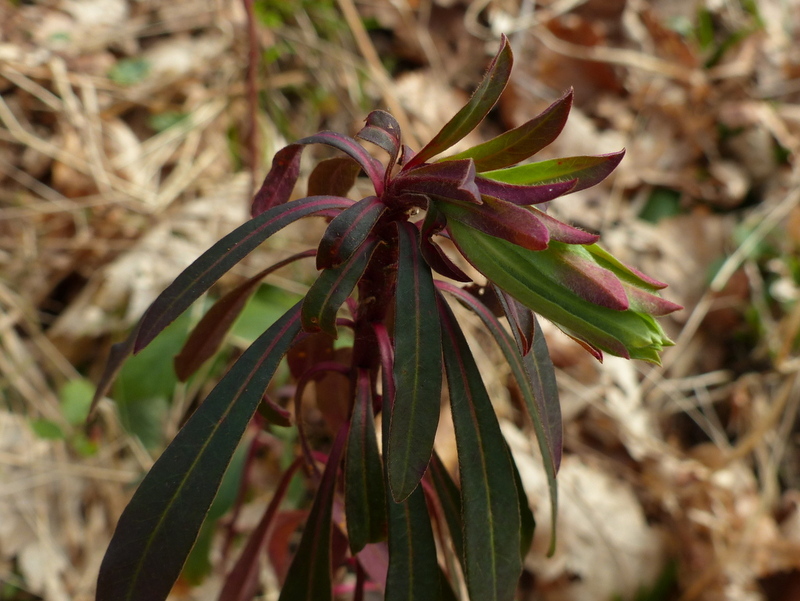 When it is up and running I would appreciate a visit from you to check that I have identified them correctly. But only if you have the time and inclination. 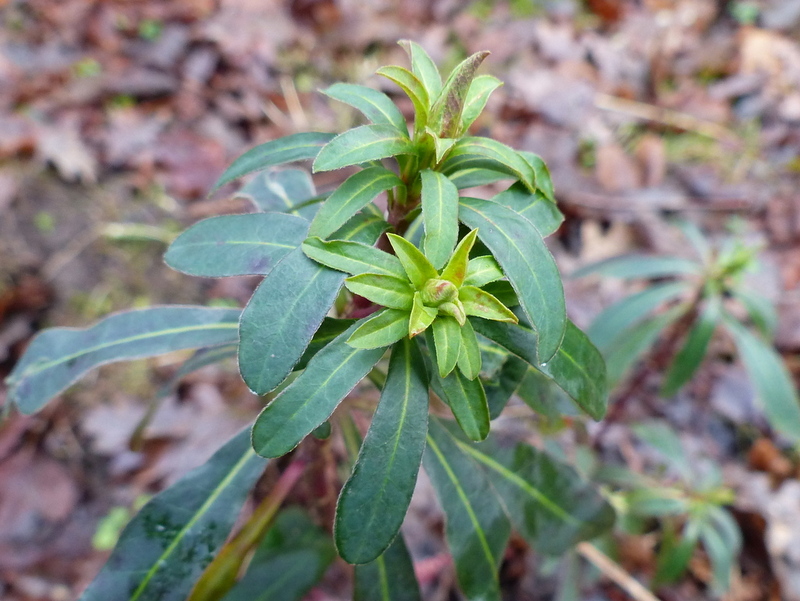 No Wood Spurge here but the map in my flower book says they could be found in East Anglia a little to the west of me. I will have to go on a field trip. Thank-you for the link to Andrew’s blog. I always enjoy the comments he makes on your posts. Thank you Clare 🙂 It looks like your weather is no better than ours. I will look forward to your Dragonflies. Every season have magic emotions!! Beautiful Video! 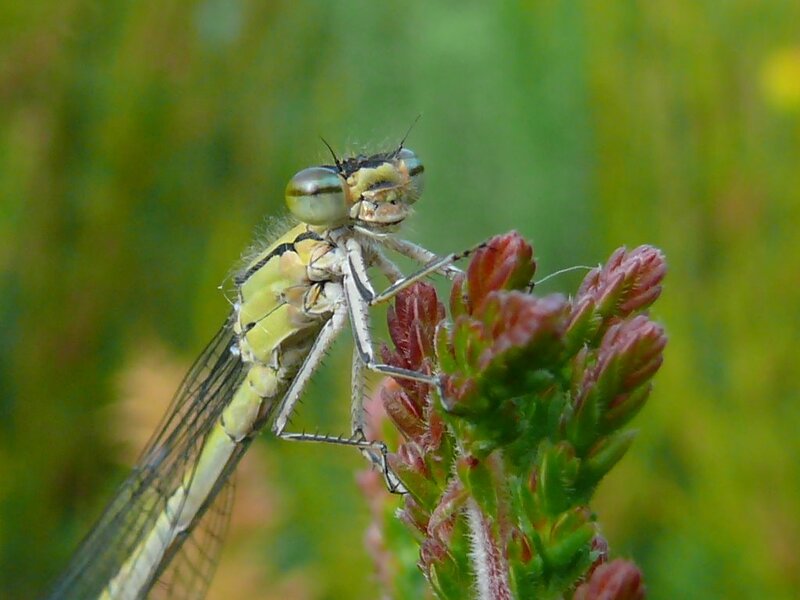 Your photography of the dragons and damsels is amazing! Thank you Sarasin 🙂 They are beautiful creatures to photograph. Lovely photos and a good read 🙂 As always Fizz is charming. Have a great weekend! Thank you Charlotte 🙂 I loved your Frog post, it is fascinating that they can hibernate under water. You too have a great weekend. Too late Colin, I am on my way tomorrow night. No going back but you have shown me what I can look forward to. I always enjoyed Odd Odes (Cyril Fletcher) and chasing a broad body is good sport. I have plenty of warm and dry clothing packed but no shorts. I’ll bring those next time. Stay inside with Fizz until it is light and warmer. Thanks Andrew 🙂 By the time you get here winter will be over. I hope that you have a good flight and it is not too tedious. Lulu seems to have the better deal with a direct flight and I hope that you don’t have cause to envy her in her own crate (plenty of leg room) in a heated hold, taking the fast route. Colin what great photos. 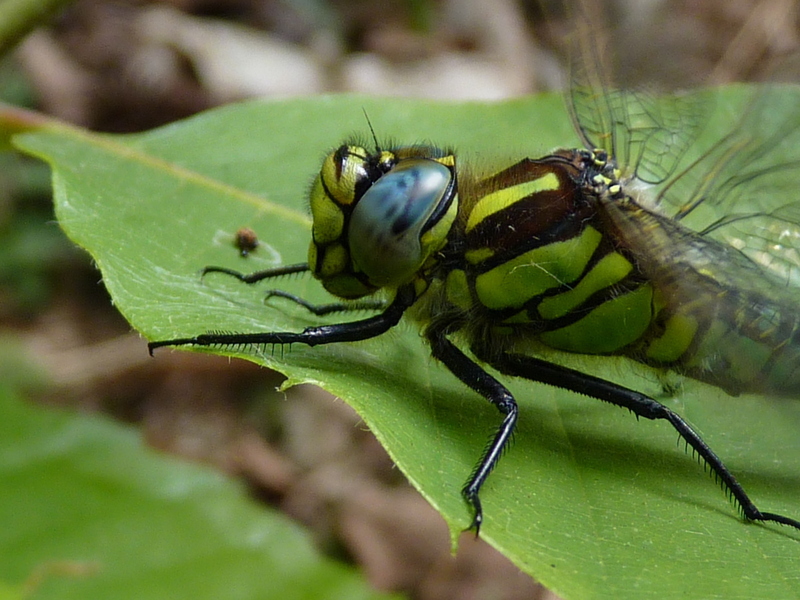 what camera are you using (and lens) for those super dragonfly close ups? Also are you taking them in the early morning before they become fully active? I’m toying with the possibility of a Macro lens on my Canon, but a good one costs £700. I’ve heard good reports about a Sony, and I’m more concerned with results (and cost) than the camera brand/image. Thank you Gigi 🙂 Yay! This Blog is one of the most wondrous yet! 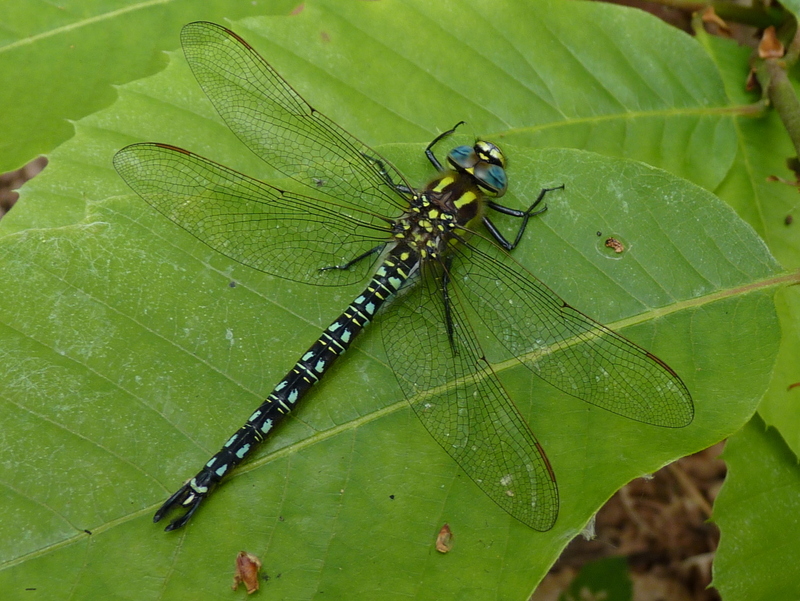 The beautifully marked Dragonflies and the cyathium ….we learn so much. 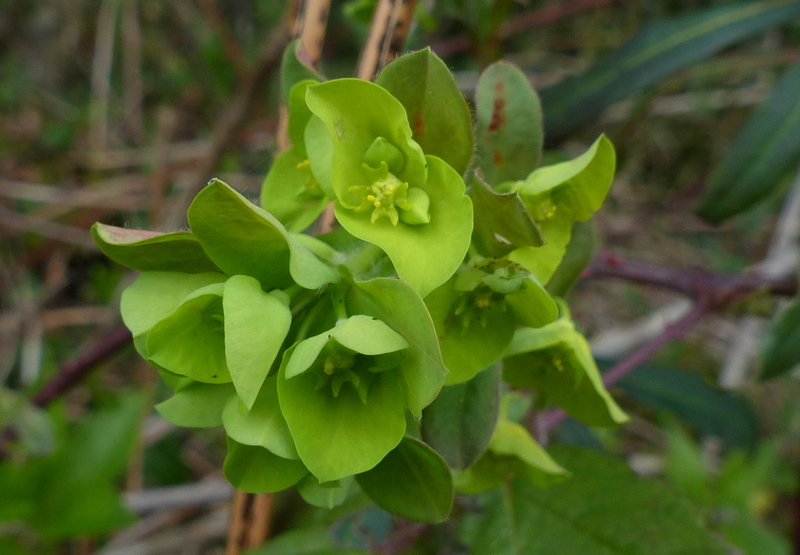 … the green flower is one I have never seen before and I find it lovely. Another great read. 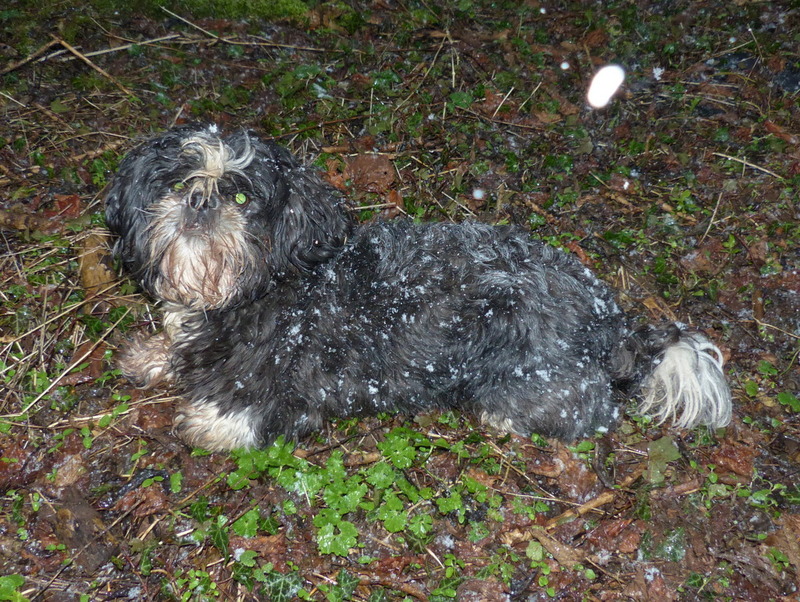 Fizz was enjoying snow. Do you receive a great amount of snow? The NE is all but snowed under right now. Our area has, fortunately escaped much of it…so far. Thanks for a good morning at my computer. Ugh the weather looks awful. 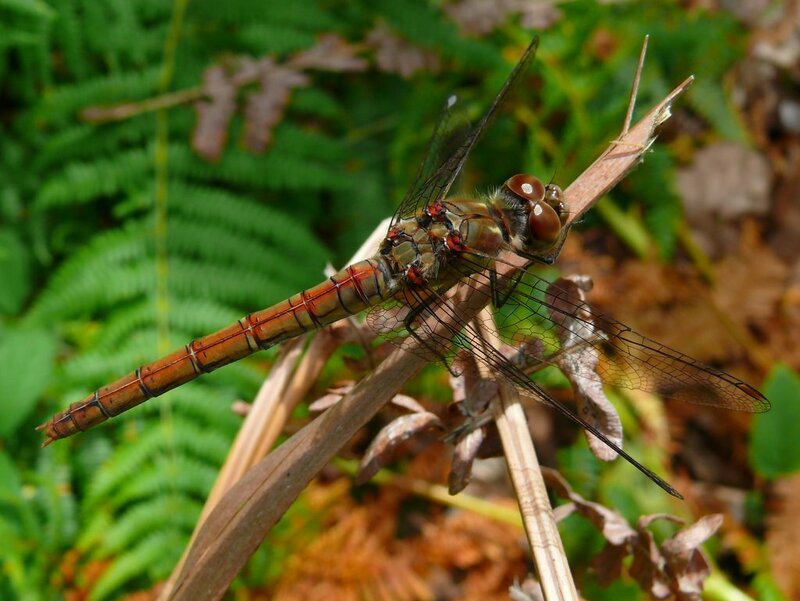 We have some large dragonflies here commonly called ‘the devil’s darning needle’ but I haven’t seen any of them up here in the north. We saw quite a few when we lived further south though. Thank you Maureen 🙂 Blimey! Do they ever try to sew you? Thank you Eliza 🙂 I didn’t see nearly as many Dragonflies last year as I would have liked. I am hoping for more this summer. Darters, chasers, skimmers and hawkers. Harry Potter and Quiddich all over again. But yours are real although really quite magical as well. Thank you John 🙂 Magical midge eaters. 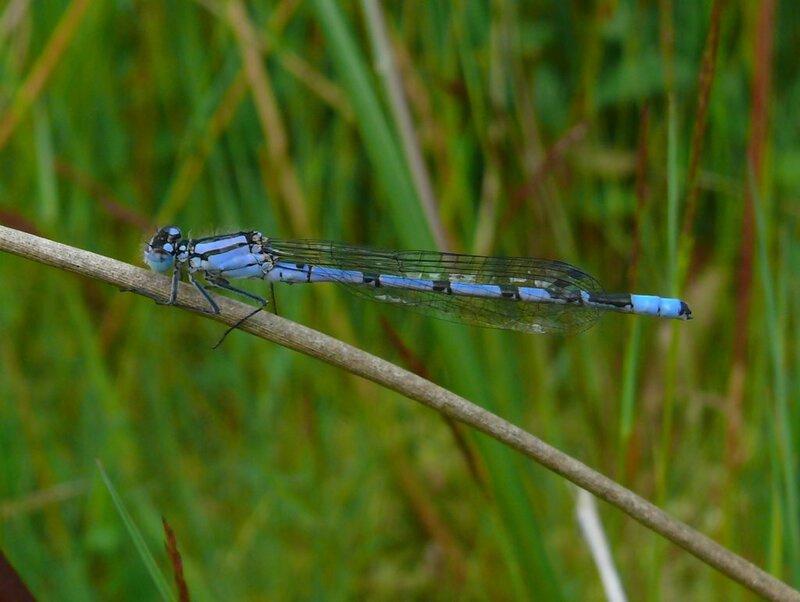 I never realised the Male and Female Blue Damselfly’s were different colours. Thanks for sharing, Colin. 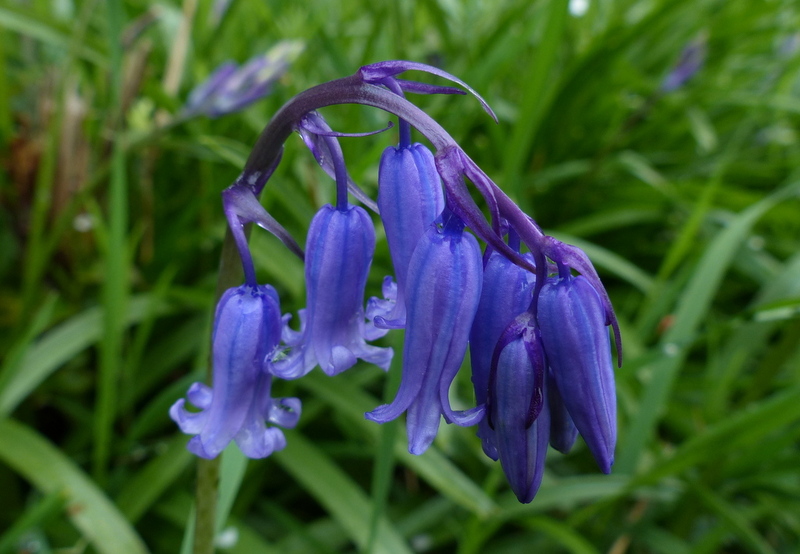 I see them all the time in summer and always assumed only the blue coloured ones were that variety. I shall have to look more closely in the same vicinity and see if I can spot the females. It cold, wintery and looks like rain all day here in Melbourne, Aust. I know I should be glad for the garden, but I was all set to go outdoors for some photography. Hrmmph! We haven’t gotten any snow yet. Of course, North Carolina doesn’t know what season it’s in. One day it’s Spring, the next day it’s Fall, the next day it just might be Winter. Now that we don’t have to drag out to work, I’d love seeing it snow. Happy Trails!! Thanks Sandi 🙂 It has been a lot like that here. We have had some really nice days this winter. 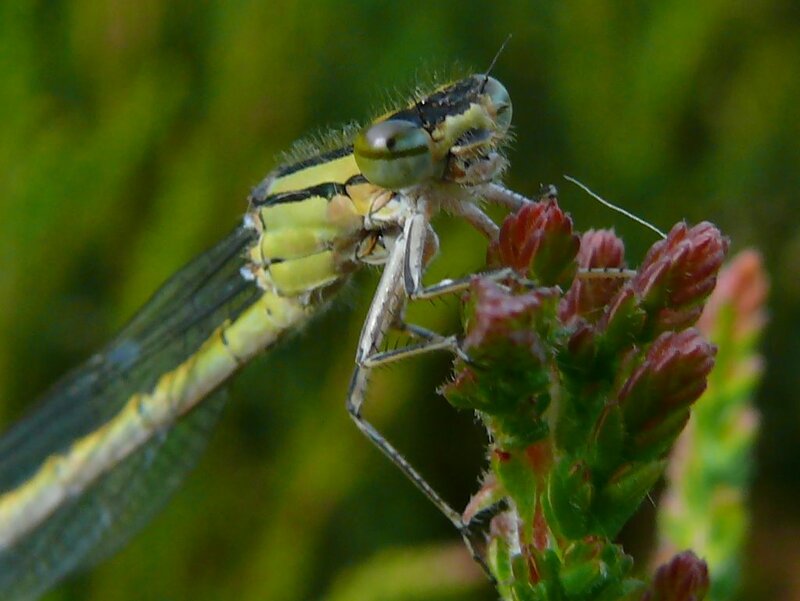 You are so clever to get the dragonflies that close up. I love their delicate wing patterns and your captions make me crack up. Thank you for reminding me of those beautiful insects. 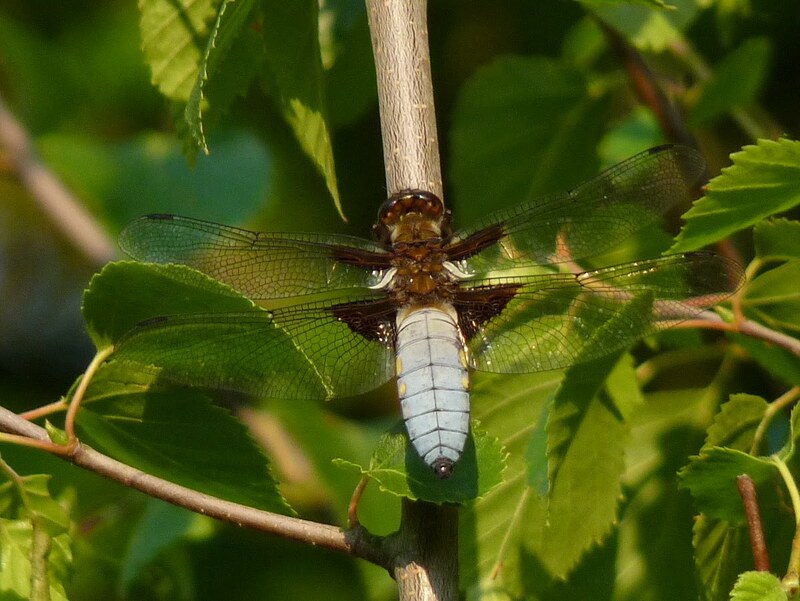 I just realized that I have not seen dragonflies in years and it was nice seeing the pictures. Thank you very much for your comment 🙂 I hope that you see some soon. No damsels in distress but there be dragons 😀 Great shots with your handy panny. Those lime green spurges are euphoric 🙂 But don’t tell Fizz she looks like she has dandruff lol. Thank you Stephanie 🙂 It’s Okay, Fizz’s dandruff has cleared up now and the sky has turned blue again. 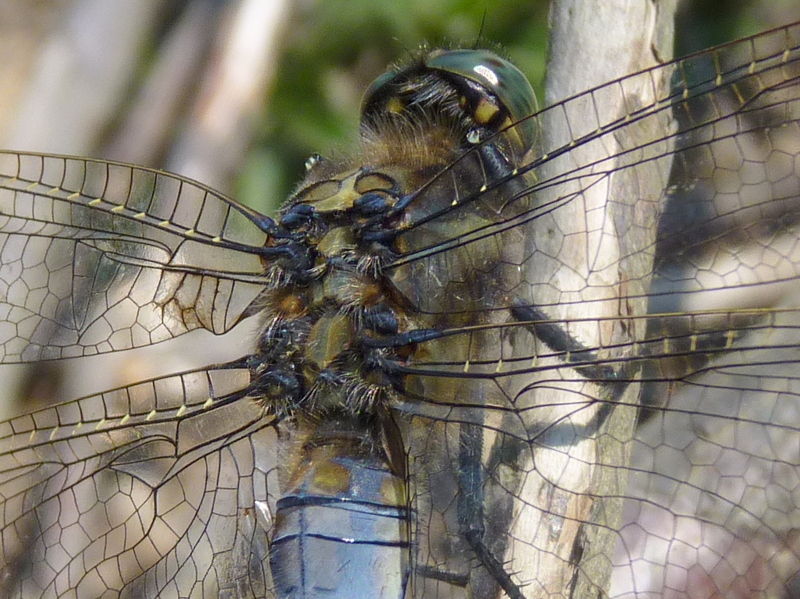 The dragonflies have such beautiful colouring. Nice images!